Double X Science: We can't stop preterm births. Can we do more for preterm babies? We can't stop preterm births. Can we do more for preterm babies? weighing less than 2 pounds. Via Wikimedia Commons. A new study out in The Lancet today makes it clear that training and equipping health workers to care for preterm babies is the key to saving the 1.1 million such babies who die every year. That's because we still know very little about how to prevent babies from being born too soon. A distinguished research team led by Save the Children has found that even if the United States and other high-income countries did everything science currently tells us could help, the vast majority of these early births -- 95 percent -- would continue. Thus, our option seems to be developing better capacities to continue the incubation that should be taking place in utero out of the uterus. Another issue is bringing sophisticated life-saving care to low-resource areas that lack facilities for mothers and preterm babies. Surprisingly, one effective technique for helping preterm babies is also a very low-tech approach: It involves simple skin-to-skin contact between mother and baby, with the baby wrapped bare skinned to the mother's own bare skin. This "Kangaroo care" is not a uterus, but it's a warm maternal environment just the same. And it's not a guarantee of survival. Yet even when survival is not an option, this warm contact might provide some comfort for both mother and infant when death is imminent and happens to be something fathers can do, too. 'Premature' is a term with a wide range of implications, and one that is often used interchangeably with "preterm" because they both are rough measures of developmental averages. Babies born before the end of 37 weeks of pregnancy are considered premature. By that definition, I had two premature babies. Yet we left the hospital with them in a matter of 48 hours, with no special care required, and some people would distinguish them as being "preterm" (not at 37 weeks) versus "premature" (not fully mature). That said, they had feeding issues and developmental delays, and there's no way for me to know if three or four more weeks' longer residence in the womb would've made that any different. Possibly more relevant to immediate outcomes is the breakdown of prematurity into categories. My two early-ish babies were "late preterm," meaning they were born between 34 and 37 weeks. 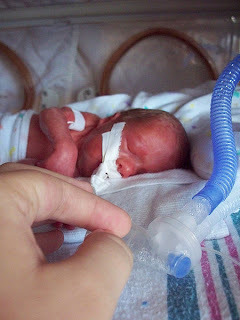 I have nieces who were on the edge of "very preterm" because they were born just short of 32 weeks of pregnancy, and they had to stay in NICU for awhile. Any baby born at less than 25 weeks is considered to be "extremely preterm." As a side note, these lengths are for pregnancy as counted from the last menstrual period. Even for babies who survive being born early, some pitfalls may await, however. A long list of conditions has been linked to prematurity, but I'm not going to detail them all here. Prematurity is a greater risk for some conditions than others, and on some cases, the risks are very small. Every premature child will have a unique experience and a unique set of outcomes. Rumor has it that Sir Isaac Newton, one of the most brilliant scientists who ever lived, was born quite premature and weighing only three pounds. According to this About.com link, other famed preemies include Mark Twain and Anna Pavlova. Prematurity is a cumulative thing. The record for survival of the shortest gestation is 21 weeks, 5 days, but that's a record no one wants to break for the tradeoff of longer in the womb. The longer a baby can stay in, the better the results. Being born premature at about 22 weeks and surviving is an extremely rare outcome. Among the smallest premature babies ever to survive weighed in at just over a half-pound and could fit in the palm of her doctor's hand. She was born at 24 weeks. According the March of Dimes, the United States has a premature birth rate of about 1 in 8 births, which the organization says is higher than that of "most developed nations." This rate is extremely variable from state to state, however, reaching as high as 17% in Mississippi (about 1 in 6 births) and as low as 9.1% in Oregon, which is still 1 in 10 births. If you're in the US and want to see your state's stats, the March of Dimes has an interactive map linking to more information. Saturday, November 17, is World Prematurity Day. If you can, consider making a donation to the institution of your choice that supports providing the best care for preterm infants. Support like this can ensure outcomes like these celebrity children had for people who don't have the kind of healthcare celebrity affords. The opinions in this piece do not necessarily reflect or conflict with those of the DXS editorial team or contributors.